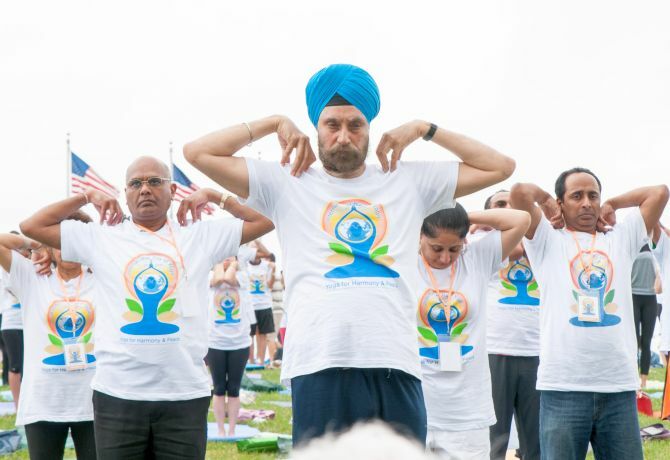 Hundreds of yoga enthusiasts gathered at the historic National Mall in Washington, DC ahead of the third International Yoga Day to mark the event. 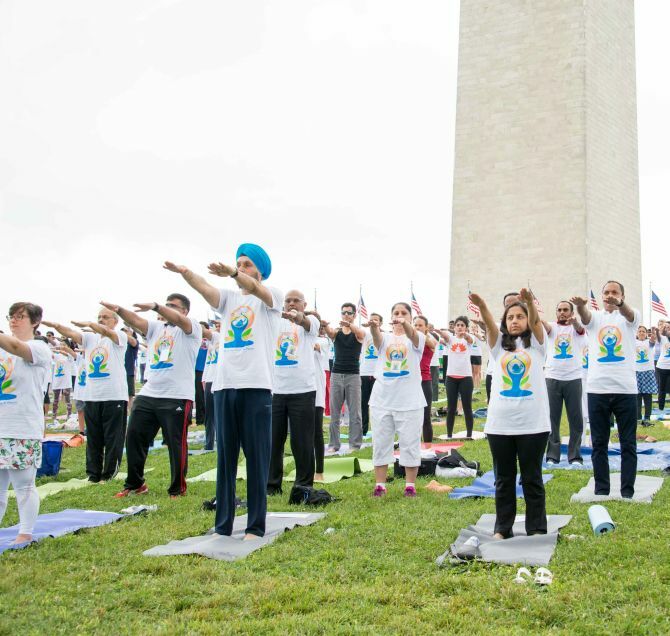 The Indian ambassador to the US, Navtej Sarna, said it was a moving sight to see people turning up in large numbers at the heart of the US capital for the event. “What has happened in the last three years is quite phenomenal, that this movement of pushing forward and achieving recognition of the 21st of June as the International Day of Yoga, started by Prime Minister (Narendra) Modi, has brought this ancient discipline, philosophy, and practice from India into the hearts and lives of people in every corner of the globe,” he said at the event on Saturday. Sarna said the international event is neither a political movement, nor an economic movement. of human beings,” he said. “If we have each human being who has a balanced view on life, who has achieved a kind of equilibrium inside and outside, I think ultimately will go and affect how nations govern and are governed and how they relate to each other,” Sarna said. Maryland Governor Larry Hogan, in a citation, sent his best wishes for “a joyous observance” of the third International Yoga Day organised by the Indian embassy in association with the Friends of Yoga. Virginia Governor Chris Van Hollen also sent his citation on the occasion in recognition of “the spiritual value that yoga and meditation offer, and with appreciation and gratitude for the organising committee’s outstanding efforts to encourage, peace, harmony and consciousness”. 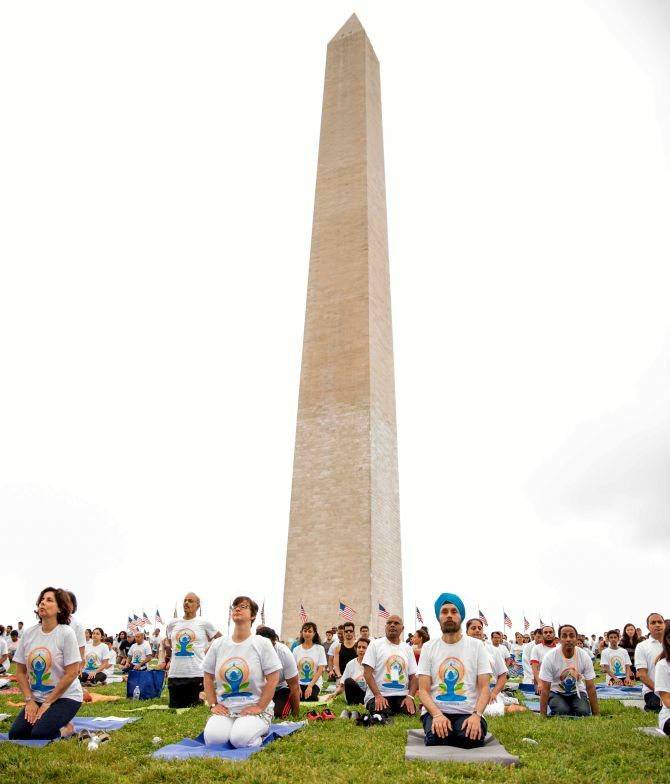 Extending warm greetings to all who are gathered on the occasion, Senator Mark Warner, in his message, said the event provides an opportunity to celebrate one of the many important traditions of the Indian culture, yoga. “The appeal of this ancient, holistic tradition crosses cultural boundaries and increases international understanding and friendship. I hope all of the attendees enjoy taking part in today’s activities,” said Warner, a Ranking Member of the Senate Select Committee on Intelligence and Co-Chair of the Senate India Caucus. Warner said he remains very optimistic about Indo-US relationship, and continues to believe that they can make great strides together. “As two of the world’s largest democracies, and with the incredible Indian-American population that contributes so much to our culture, commerce and community in this country, it is critical for us to continue to deepen and broaden the existing framework of partnership and friendship. “In the last Congress, we were able to expand the US-India relationship on several fronts, including hosting Prime Minister (Narendra) Modi for a joint session. During this session, the prime minister described the many ties that bind India and the US together, as well as the significant contributions the Indian-American community has made to this country,” he said. “The overwhelmingly positive response to his visit demonstrates the strength of the relationship between the US and India,” Warner added. Would you try 'Goat Yoga'? Yoga gets a league, but will it work?